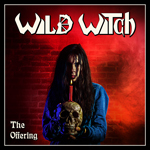 Wild Witch are a heavy metal band from Brazil formed in 2011, releasing the 'Burning Chains' E.P. the following year. The bands singer left the band in 2016, with founding member, (and bass player) Felipe Rippervert taking over vocal duties. 'The Offering' is the bands first full length album and was released in 2017. Possessing an insane amount of NWOBHM traits, Wild Witch unleash their debut album with the thundering and anthemic 'Heavy Metal Inferno'. Infectious and catchy with a sing a long style anthem of a chorus, 'Heavy Metal Inferno' is everything a NWOBHM fan will enjoy. 'Night Rulers' picks up the pace and thunders along at a high tempo. The buzzing guitar sound of the NWOBHM takes front and centre as 'Night Rulers' evokes memories of bands such as Angel Witch and Raven, both of whom were leading lights in the evolution of the NWOBHM genre. The high tempo is kept up as 'To The Lions' gallops along furiously, invoking hard head banging. The rampaging pace of 'To The Lions' is infectious and a joy to the ears. Wild Witch are part of a new breed of heavy metallers coming out of Brazil, following bands such as Dark Witch, Fire Strike, Hazy Hamlet and Fates Prophecy. The future of heavy metal from Brazil is looking very bright indeed. Slamming riffs and hard hitting drums, 'From The Purgatory' takes on a mild doom style feel as it stomps very hard. An anthemic style sing a long chorus adds more catchiness to an already catchy song. A scorching turn of pace mid way through and a blistering, screechy guitar solo changes the feel of 'From The Purgatory', but is short lived as the song returns to the doom heavy style as it rolls on to an end. Wild Witch are impressing with their first album, albeit at only eight songs in length is a little light on numbers. Upping the pace and adding elements from the heavy rock genre, 'Diabolic Jaws' features a rampant rhythm that blends the classic sound of traditional heavy metal with NWOBHM. Head bangingly infectious, 'Diabolic Jaws' is a wide smiling inducing song right off the top shelf. 'Blades Of Pain' sounds brutal, but is a hard rocking heavy rock song of immense head banging proportions. Very much a "foot on the monitor" style song, 'Blades Of Pain' is a thunderous romp with a chant style chorus everyone is gonna shout at the tops of their voices... 'Exiles In Hell' adopts a mid eighties Iron Maiden vibe as it chugs and chops on its relentless way. The buzz guitar sound of the NWOBHM genre is such a prominent feature of the Wild Witch sound, it does raise the question of are they able to progress their sound on future releases? Only time will tell, but until then, their debut album comes to an end with the electrifying pace of 'Lightning On The Road'. Powering on at speed, Wild Witch romp to the finish line in furious fashion. Overall, an impressive debut, heavily influenced by the NWOBHM sound, Wild Witch have delivered a head bangingly addictive and infectious album.